Plans for five retail shops and three residences have already been drawn by the current owner and are ready to be submitted to Council. 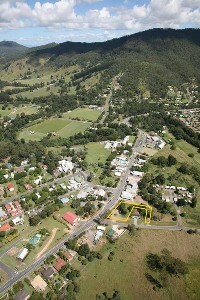 Possibly the most prominent position in the Main Street of Canungra, this is the perfect place to invest! Here is a prime development opportunity with two street frontages and massive passing traffic. Virtually opposite the intersection of Lamington National Park Road, the gateway to the world heritage listed Lamington National Park and O'Reillys. You'll be in good company, with the famous Outpost Cafe as your neighbour. This property must be sold, imagine the annual rents from 8 tenancies!